The latest version of RooWifi API (1.1) is based on the gateway mode and it’s programmed using Qt Creator cross-platform IDE, which allows developers to use Windows, MAC, GNU/Linux,… Next revisions will have support and the required modifications to be able to develop with Visual Studio, gcc,g++ and Python. You can clone our latest API version from a Github Repository or download directly compressed in a ZIP file. Please take a look to Developer notes and the reference before using the API. In roowifi.h comment #define ROOWIFI_DEBUG to disable debug output messages, this define is enabled by default. If AutoCapture mode is used, when the RooWifi::Sensors is updated, the class generates an AutoCaptureUpdated() SIGNAL. If not the generated SIGNAL is DataReady() when a data byte is received from the RooWifi (eg, manual sensor reading using ExecuteCommand functions). 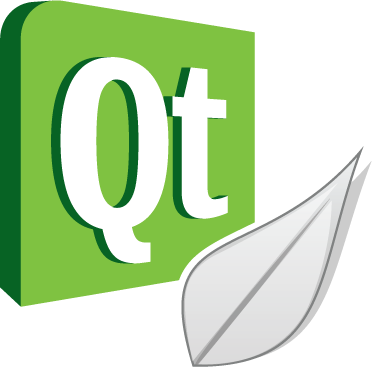 The RooWifi API 1.1b Example App is made under Qt Creator 5 in a MacOS system, if you compile this project with Qt Creator under Linux or Windows the buttons or some elements of the GUI could appear with different aspect. Sets the IP address of RooWifi. You need to call this function to select the IP address of your device. By default the IP address of RooWifi is 10.0.0.1 (the default IP address of RooWifi in Ad-Hoc mode). In Windows Systems you could use the NBNSBios name to connect to your RooWifi. Returns a QString with the NBNSBios name of your RooWifi or you RooWifi’s IP address. Try to connect to RooWifi using a standard TCP/IP socket getting the IP address set in SetIP(QString NewIP) function. If it causes an exception or any error occurs while connecting process it will generate a trigger signal. Disconnects from RooWifi and close the TCP/IP socket connection. Returns true if the connection is established or false if not. Puts Roomba in Safe Mode. You can drive your Roomba but when it detects an obstacle or something that could damage the robot it will stop automatically and will set itself to Passive Mode (default). Puts Roomba in Full Mode. Enables unrestricted control of Roomba and turns off the safety features. Be careful using this mode while driving or controlling Roomba. Starts a normal cleaning cycle, the same as a normal “clean” button press. This command puts in Safe Mode. Starts a spot cleaning cycle, the same as a normal “spot” button press. This command puts in Safe Mode. Turns on force-seeking-dock mode, which causes the robot to immediately attempt to dock during its cleaning cycle if it encounters the docking beams from the Home Base. (Note, however, that if the robot was not active in a clean, spot or max cycle it will not attempt to execute the docking.) Normally the robot attempts to dock only if the cleaning cycle has completed or the battery is nearing depletion. This command can be sent anytime, but the mode will be cancelled if the robot turns off, begins charging, or is commanded into safe or full modes. 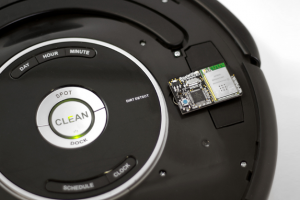 A Drive command with a positive velocity and a positive radius will make Roomba drive forward while turning toward the left. A negative radius will make it turn toward the right. Special cases for the radius make Roomba turn in place or drive straight, as specified below. The robot must be in safe or full mode to accept this command. Status Led – Deprecated if using >= Roomba 500 series. CommandToSend: Command you want to transmit to Roomba. Data: Value to transmit alter the command header. NumParameters: Number of parameters apart of Command. Lenght of Parameters array. Returns the number of bytes received from Roomba and available in the reception buffer. Once connected to RooWifi you could use this mode to refresh sensor data with the specified period of time in ms with SetAutoCaptureTime() automatically refreshing RoombaSensors structure.